Theresa Giannaris having the 24KT Gold Mask Facial at Dyanna Spa in Manhattan. A layer of cotton with gold serum is placed over the face, followed by a mask and gold foil. CHRISTINE VALMY’S Golden Collagen facial mask is a visual and tactile delight: gelatinous, face-shaped and thoroughly golden, it arrives in a sheer plastic enclosure that invites you to squish it the way that bubble wrap begs you to pop it. 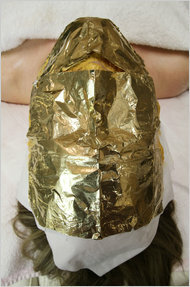 GOLDEN GIRL Theresa Giannaris having the 24KT Gold Mask Facial at Dyanna Spa in Manhattan. A layer of cotton with gold serum is placed over the face, followed by a mask and gold foil. Gold face masks by various companies. I couldn’t wait to put it on and lie down for the recommended time. Cool and slimy, it feels like Jell-O on the face. The rash that erupted the next day did not. “That’s not from the gold,” said Marina Valmy De Haydu, president of the skin care company founded by her mother. “Gold is not irritating to the skin at all.” Rather, she said, it was another ingredient in the mask — arbutin — that had given me problems. “When you have very sensitive skin, you have to be more than careful with masks,” she advised, sounding eerily like my dermatologist. While doctors may disagree with her about whether gold can be irritating, it has become a go-to ingredient in skin care products. It has been flaked, liquefied and otherwise suffused in moisturizers and sunscreens, eye creams and lip balms. Spas advertise 24-karat gold facials, a splurge typically costing north of $100. Fancy brands like La Prairie and Guerlain sell golden wares at high-end stores like Nordstrom. Does anyone remember “Goldfinger” ? Apparently they do. I asked the owner of Chantecaille, a brand that sells products like a Nano Gold Energizing Cream ($420 for 1.7 ounces at Neiman Marcus andBergdorf Goodman), what customers typically ask before they buy. When cosmetics executives describe the purported benefits of gold for the skin, they seem to be reading from the same PowerPoint slide: anti-aging, anti-inflammatory, anti-acne. People who sell creams with visible gold flecks talk about the ability of those flecks to warm the skin and make it conducive to other ingredients. People who sell gold in nano form — that is, in microscopic particles suspended in a liquid mixture known as a colloid — look down on this crowd, saying that gold can confer benefits only when it is broken down small enough to penetrate the skin. But is it true that gold has therapeutic qualities? That depends if you ask someone who is selling it suspended in cream or someone who went to medical school. Dermatologists speak with one voice, saying that gold cannot help you, but it absolutely can hurt you, causing inflammatory reactions like contact dermatitis (which may be what happened to me). In high doses, gold can be toxic, but these products probably don’t contain enough of it to make that happen, doctors say. But Dr. Graf did find that gold was named “allergen of the year” in 2001 by the American Contact Dermatitis Society. The skin care companies tend to counter these statements by saying that they have proprietary research showing the benefits of gold. Over at La Prairie, which sells three products with colloidal gold, Holly Genovese, a vice president, said that the company’s scientists had found a way to use gold that is valuable to the skin. When La Prairie’s Cellular Radiance Concentrate Pure Gold ($580 an ounce) was introduced in 2006, it was “the first big, major introduction of any major cosmetic company using gold in a skin care product,” Ms. Genovese said. The product, which she described as “a multitasking serum for the face,” has been “a huge hit for us,” she said. La Prairie has just come out with a line of products that contain colloidal platinum — including a cream that costs $1,000 an ounce — and plans this fall to introduce a gold-infused sunscreen/moisturizer that will cost $425 for 1.7 ounces. 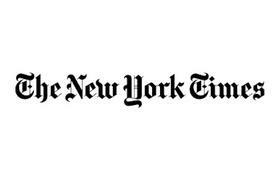 “Our customers are waiting with bated breath,” Ms. Genovese said. Gold is certainly an “it” color this year, on everything from gladiator sandals to slouchy handbags to eye shadow. And the price of gold may have something to do with it: it has been fetching record prices, in the vicinity of $1,200 an ounce, in the commodities market. While that does give cosmetics companies an easy reason to jack up prices, not all products that contain gold are wildly expensive. At one end of the spectrum is La Prairie. At the other is the Christine Valmy mask that I tried, which costs $13.50 for one application. Another line is Oro Gold, whose manufacturer, Mazal Enterprise, boasts that its products contain both nano gold and gold flakes. In a telephone interview, Keren Ballard, a marketing executive for Oro Gold, outlined a number of benefits: gold, she said, is hypoallergenic, stimulates blood circulation, reduces sunspots and acts as an antioxidant. In marketing materials, companies that sell gold creams are far more circumspect. The Food and Drug Administration does not recognize gold as an active ingredient, though it is recognized as a colorant by the Personal Care Products Council, a trade association. At Dyanna Spa, a body and nail salon in Manhattan, the owners let me look at a package of the powder used to create the signature mask in their 24KT Gold Mask Facial. The active ingredients of the mask, made by a company called Farah, are listed as sugar (which the package said “regulates skin movements”), gold pigments (“provides shine”) and betaine (“moisturizer”). The spa, which also offers facials with caviar, recommends the gold one for older clients. The use of gold as a beauty treatment “goes back to Chinese history and Cleopatra,” said Mona Winograd, an owner of Dyanna Spa. Indeed, Cleopatra was cited by nearly everyone I spoke to who sells skin care products with gold in them. We all know that she looked exactly like the young Elizabeth Taylor, but is it true that she used gold on her face as a beauty ritual? Probably not, said Duane W. Roller, a retired classics professor who just published abiography of Cleopatra. Although she did wear plenty of gold jewelry, he said, there is no reference to her using gold as a face cream. “I don’t think we have anything in the sources that tell us about what we might loosely call makeup,” he said. Cosmetics makers also habitually cite the use of gold in medicine, where it is given to patients with rheumatoid arthritis and has been used — only experimentally — as a possible cancer treatment. Debabrata Mukhopadhyay, a professor and cancer researcher at the Mayo Clinic, said that while gold nanoparticles show promise, they are “highly toxic when injected in high doses in mice.” And the size of the nanoparticles matters a lot, he said, adding that it was unclear if the particles in the gold face creams were the right size to penetrate the skin. “As a scientist, I am very skeptical unless I see research,” he said. Mostafa El-Sayed, a professor at the Georgia Institute of Technology who is also an expert in the field, said it was ridiculous to think that gold could fight wrinkles because of its use in cancer research. “The way it takes care of cancer, the nanoparticle goes only to cancer cells, none of the healthy cells,” he said. Dr. Graf, for one, would not wag a finger at that client. “I do not see anything wrong with spending money on something if it is what you like,” she said.